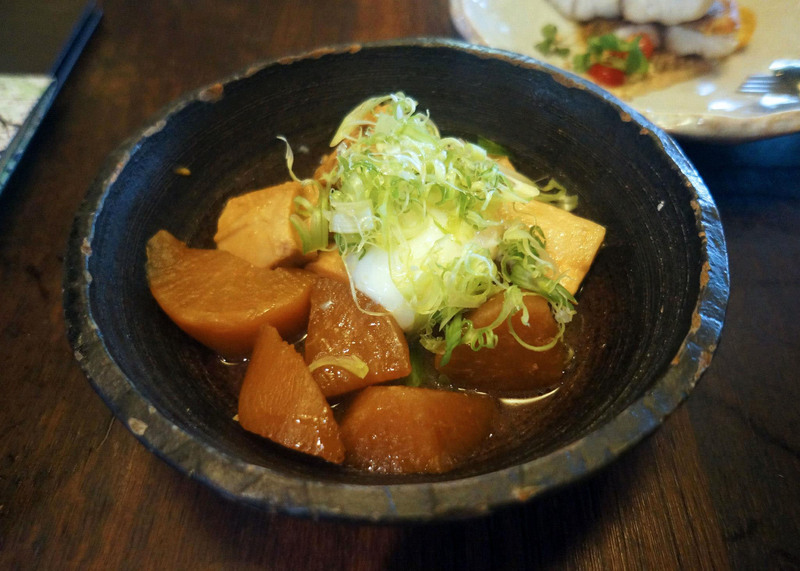 Just a week after our positive experience at Ananas Mr C decided that a visit to Sake Restaurant & Bar would be a good idea as people seem to rate it as one of the best Japanese restaurants in Sydney. Since we were only free on a weekend we decided a short lunch would be a good idea, keep in mind that they do offer a $25/$35 deal for the AX Festival in March/April each year but only on weekdays. 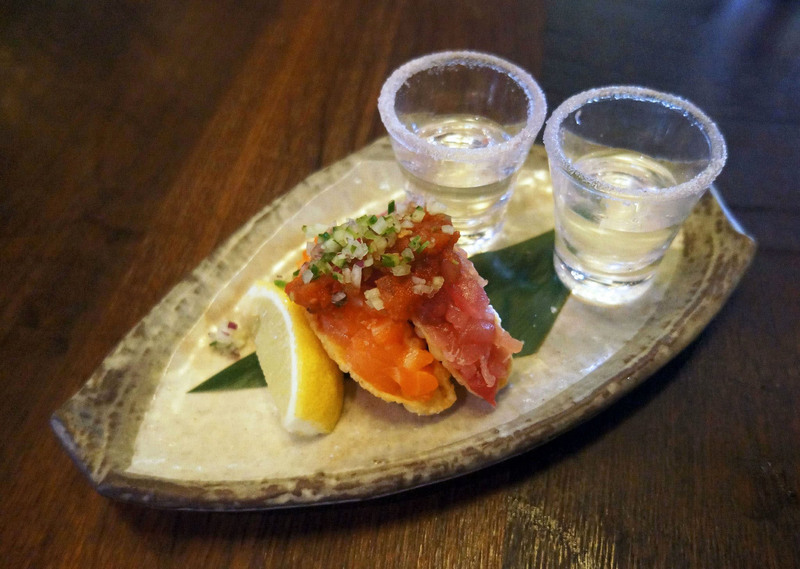 I guess the experience wouldn’t really be complete if we didn’t have sake at Sake 🙂 Lucky for us the sashimi tacos we wanted to try came with a matched shot which I had a small sip of, Mr C personally prefers hot sake for some reason though but that’s just a preference I guess! The sashimi tacos themselves were ‘average’ at best as the corn flavour overpowered the fish but I guess it was a novelty. 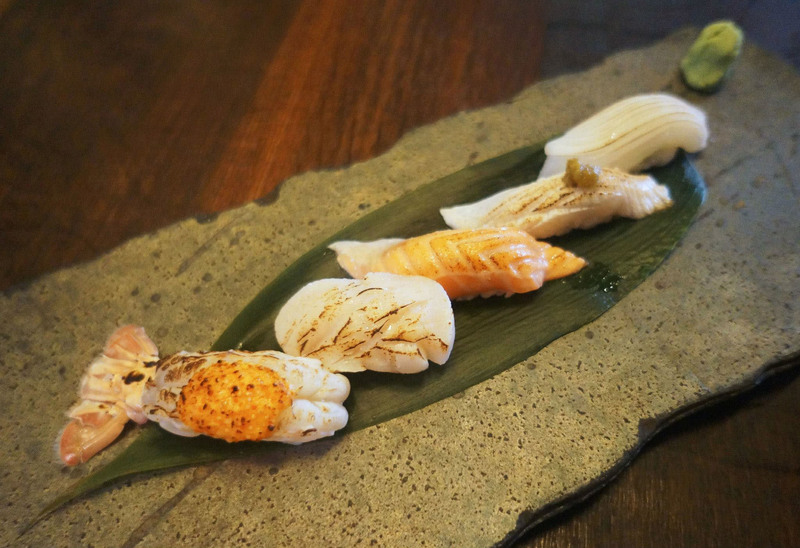 I really love any sort of grilled sushi so when I saw that they offered a plate of aburi sushi I had to order it. The types of seafood were prawn, scallop, salmon, kingfish and squid. I loved all of them and it was quite easy to tell that they used top quality seafood in their ingredients because the great taste and texture. 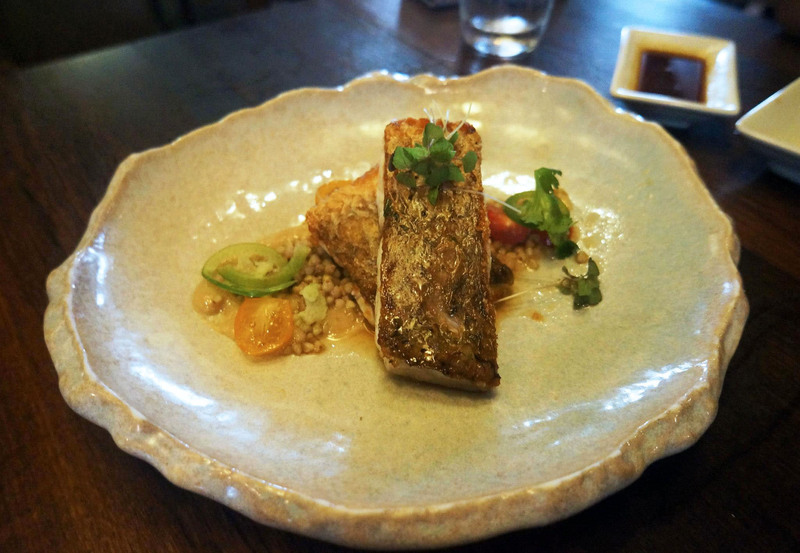 Mr C wanted to try the pan seared ocean barramundi as one of his friends mentioned that the butter soy was nice, and he was correct – it was really good with the fish. I’m also a fan of ponzu citrus sauce so that was an added bonus to an already very tender and tasty bit of crispy barramundi. I wasn’t really sure what to pick because there were so many different choices to go with that sounded delicious, I’m a fan of Japanese food after all. In the end I picked this dish because I loved the sound of 64° egg, pork belly, radish and truffle – this turned out to be the best decision of my life because this dish was easily my highlight of the night. The egg was so gooey, the tender pork belly tasted amazing and the combination of trufflle/radish was one of the most interesting taste sensations I’ve had in a really long time! I really like the interior of the restaurant and the level of service we receieved, though for the cost it’s something I would expect regardless. 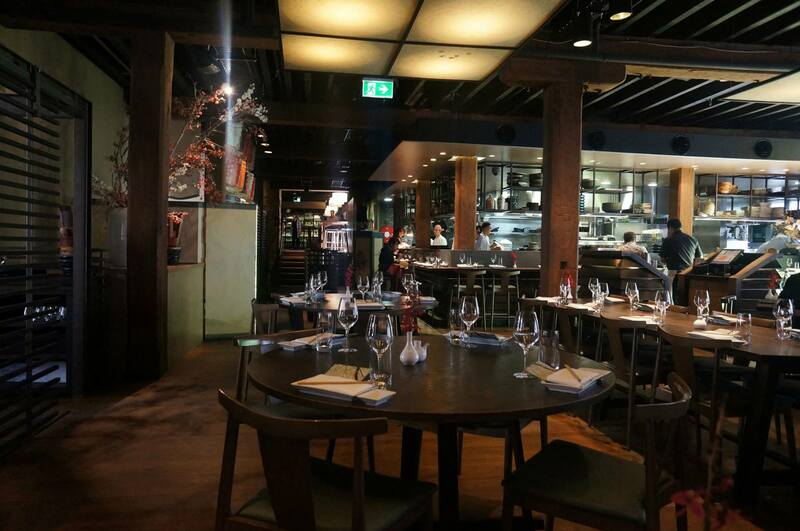 The interiors have a clean contemporary feel but with some Japanese flair in the form of traditional decorations here and there, for those that don’t know the restaurant is part of the Argyle building. We were both so impressed with the quality of the food that a visit to Sake is on the books for later this year, we really have to try all the other stuff on the menu as they looked good! ive only been to Sake for desserts after dinner at ananas and have been blown away already, cant wait to try out the food menu!